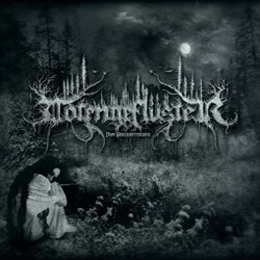 Totengeflüster (whispers of the Dead) were formed in 2007 by Totleben, who wanted to create his own interpretation of grim Black Metal with classical-symphonic elements. Soon he joined forces with a same-minded guy, Narbengrund, who wrote lyrics that did fit well to the music and ideas of Totengeflüster. Narbengrund takes care of the vocals too, by the way. And the line-up gets finally completed by Schattendorn, who performs the session drums (live as well). Vom Seelensterben is the first album by the duo, recorded completely (engineering, production, mix and mastering) at the Warroom Studio by Marc Globig. It lasts for about forty seven minutes and was completed with assistance of some sweet colleagues as guest vocalist, like Schinder Papst (Zanthropya EX) and Aggreash (Lyfthrasyr). The result is an orchestral opus of Symphonic Black Metal with a perfect balance in between obscure aggression and ear-catching melodies. The keyboards play a prominent role, bringing a hypnotic atmosphere, then again a bombastic Gothic approach. They appear throughout the whole album as back ground support (even though very prominently present), as well as for the introductional parts for many tracks. The speed varies, yet is mainly up-tempo oriented, with both fast outbursts and epic lags. For fans of: early Cradle Of Filth, Dimmu Borgir, Catamenia, Conspiracy, Aeba and Furia.